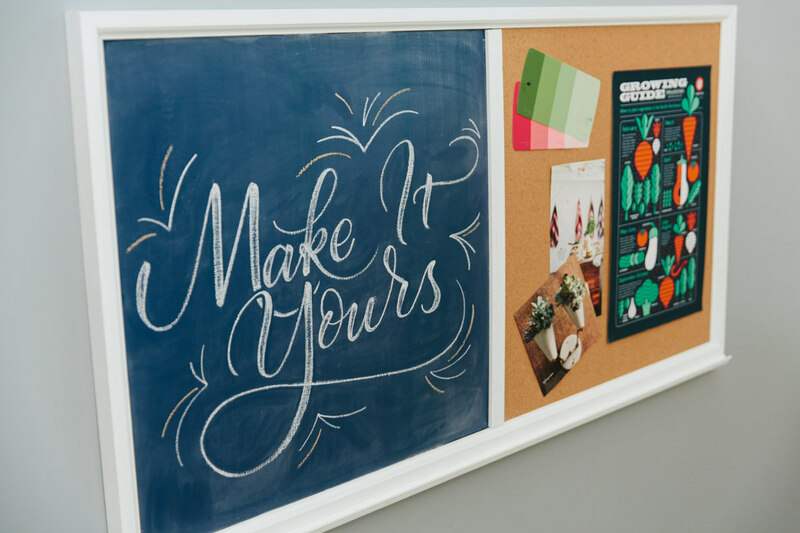 When we upgraded to the new Dunn DIY studio, we were looking for a framed bulletin board to hang on the wall that had both a chalkboard and a corkboard. I mean, what better combination could you think of for posting project inspiration and working through designs? It seemed easy enough to find, but looking around for something like this did not prove to be very rewarding. It soon became apparent that to get something even close to the picture in my head, I was going to need to make it myself. While approaching this project, I took notes from the chalkboard calendar I designed a couple years ago. I wanted to make sure I made something a little bit different, and that I improved some aspects of the original after having used that calendar in my own home. Where the chalkboard calendar is simple and sleek, this bulletin board is a bit more detailed, professional, and designed to coordinate with the moulding of the room it’s in. This bulletin board feels more grown-up in that way, and I love that you can easily make it something that’s uniquely you. One of the biggest lessons I learned from the chalkboard calendar is that I hate having a chalkboard without a convenient place to put the chalk, so I took a page from the beginning of Dunn DIY and used some upside-down trim to create a chalk holder for this one. I might need to go add one to my original chalkboard calendar now! The other variations in this project included a different (and less expensive) backboard material, colored chalkboard paint for some added flare, and a combination of screws and 3M Command Picture Hanging Strips for mounting. 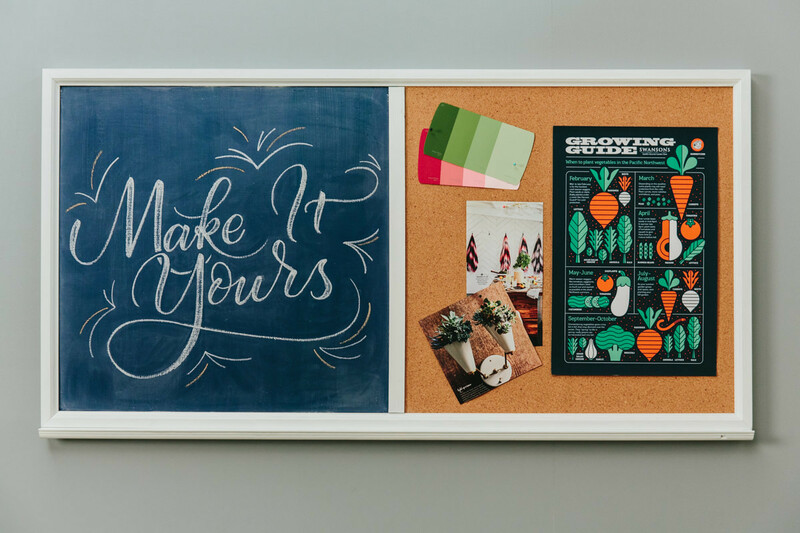 Plus, this bulletin board is half chalkboard, half corkboard—even better! I hope you enjoy this tutorial and all the lessons learned along the way. For the back of the the bulletin board, we’re using MDF (which stands for medium density fiberboard). It’s basically a bunch of wood that’s been blended up and then glued back together. 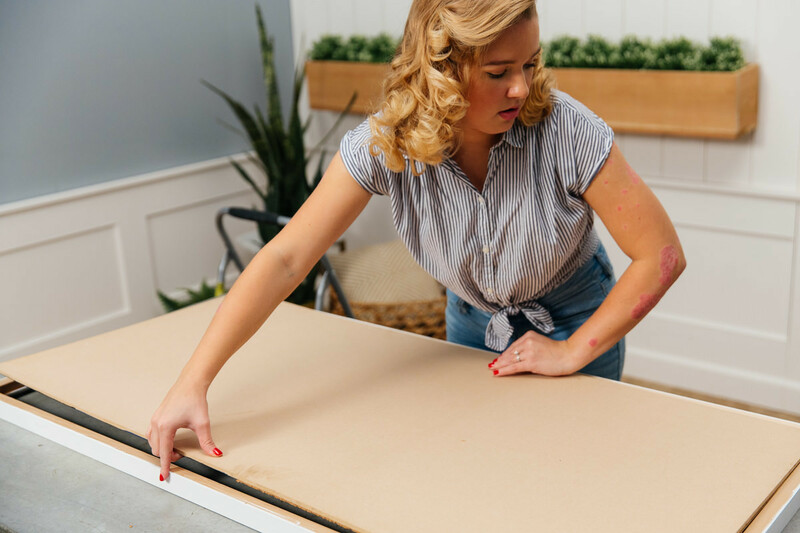 I like MDF for this project because it's inexpensive and has a smooth surface for the chalkboard paint. We’re going to cover it all up anyway, so no one will ever even know it’s MDF. 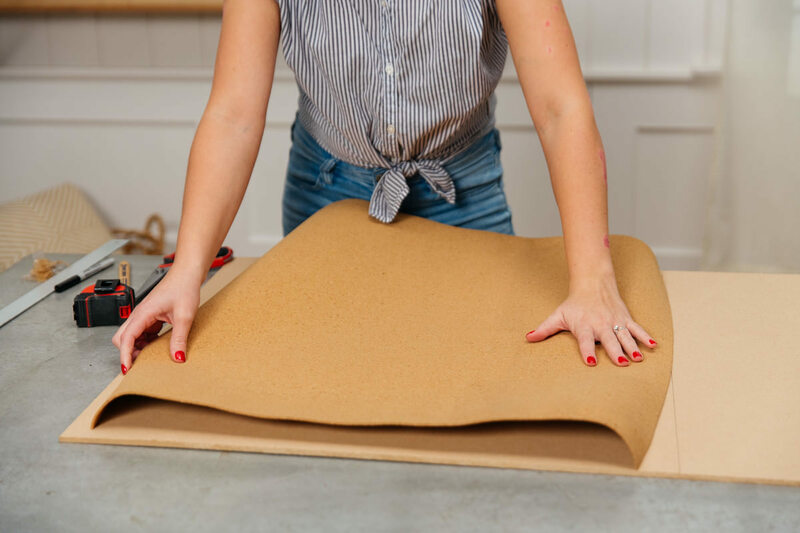 You can order a two-by-four or quarter sheet of MDF at Dunn Lumber and have them cut it for you so you won’t end up with any leftover material. 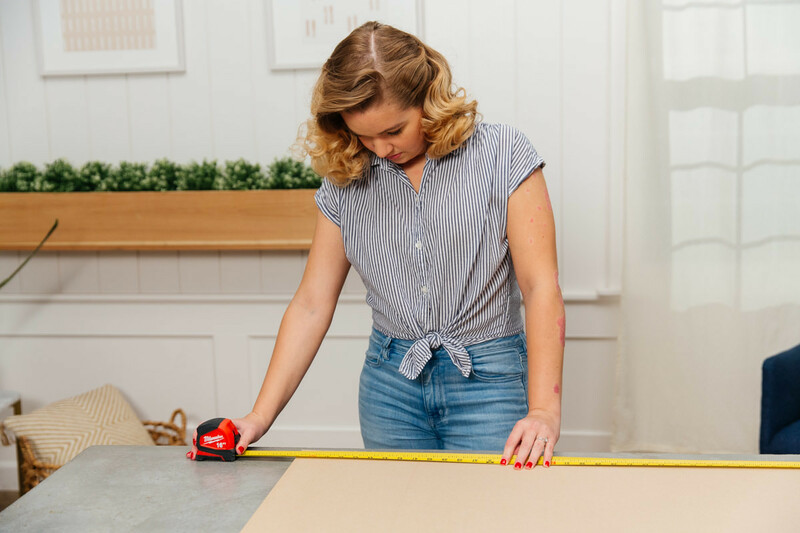 Remember, a quarter sheet of MDF won’t be exactly 24” x 48”, so take some time to measure it. 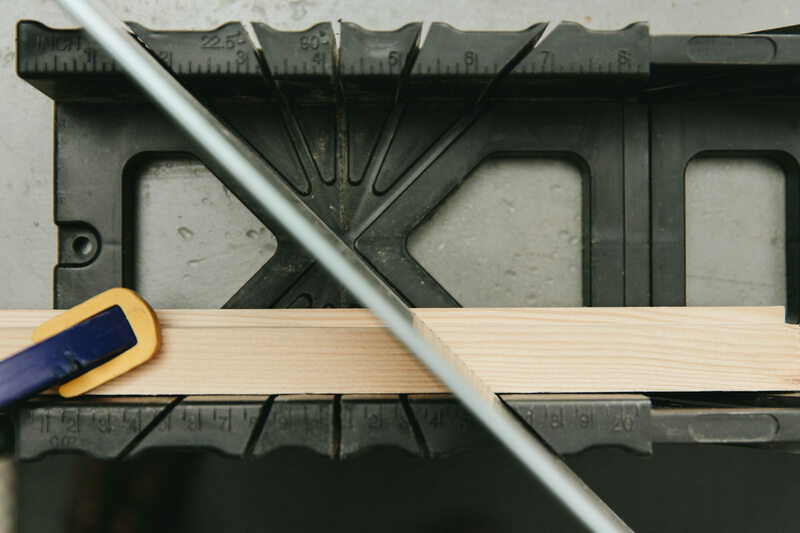 You can use a circular saw to adjust the measurements to your desired dimensions, or you can follow my lead and cut the moulding to fit the MDF to keep things really easy. 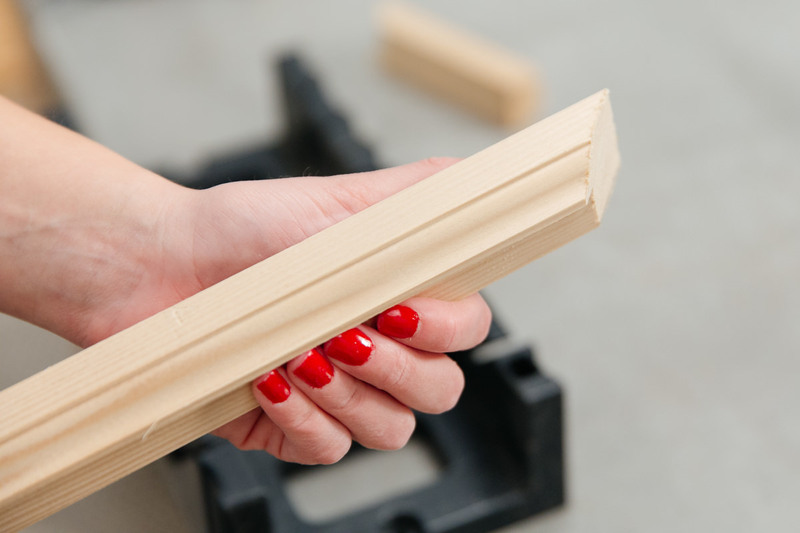 To create the frame, cut the back band moulding to size, so that it will fit around the MDF with mitered corners. It’s easiest to cut 45° angles with either a handsaw and miter box, or a miter saw. For an exact fit, I measured each of the four sides of the MDF sheet individually and cut four separate lengths. 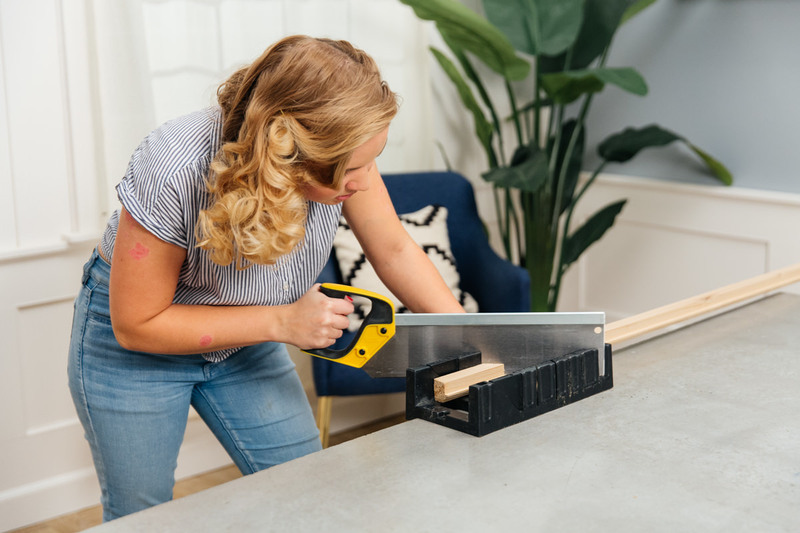 If you do this, make sure to number your cut pieces of moulding and the sides of the MDF so you can match it all up correctly later. It’s important to note that when you're cutting this moulding at an angle, there is only one right way to cut it. It’s very easy to get yourself turned around—I did myself and ended up having to make another trip to the store to pick up an extra piece of moulding. The back side of the moulding isn’t square with the sides, so you need to lay the moulding front-side down. 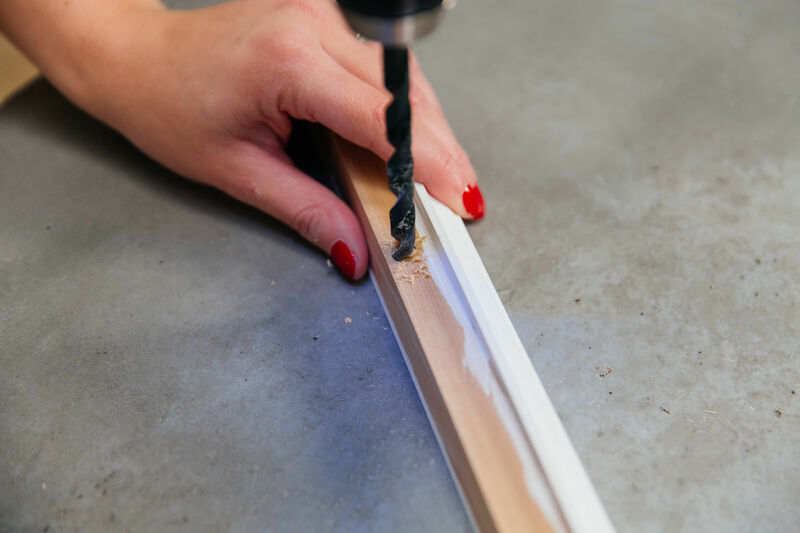 Next, be sure to check (and double-check) that the inside or shorter side of the angle is lining up with the lip on the side of the moulding. 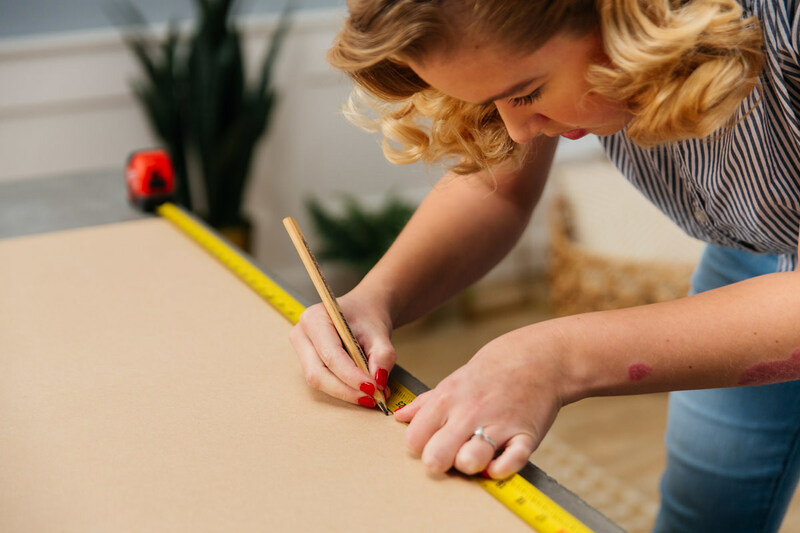 The wainscot cap moulding will span the bottom of your frame to form a chalk holder, so measure one of your long frame pieces (from point to point) and cut the cap moulding accordingly. Finally, with the top and bottom frame pieces fitted in place on either side of the MDF, measure between the edges of the frame and cut the lattice strip to the same length. This will be your divider piece between the chalkboard and the corkboard. 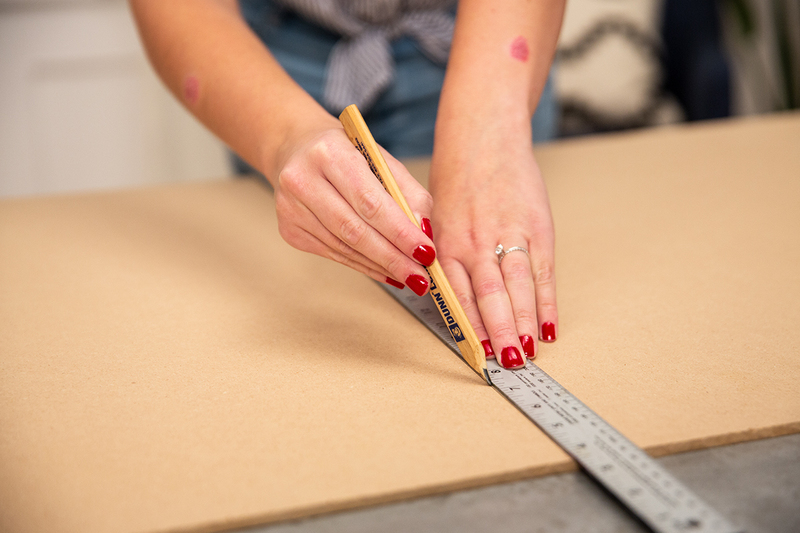 Then, determine the halfway point of the MDF and draw a line from top to bottom. 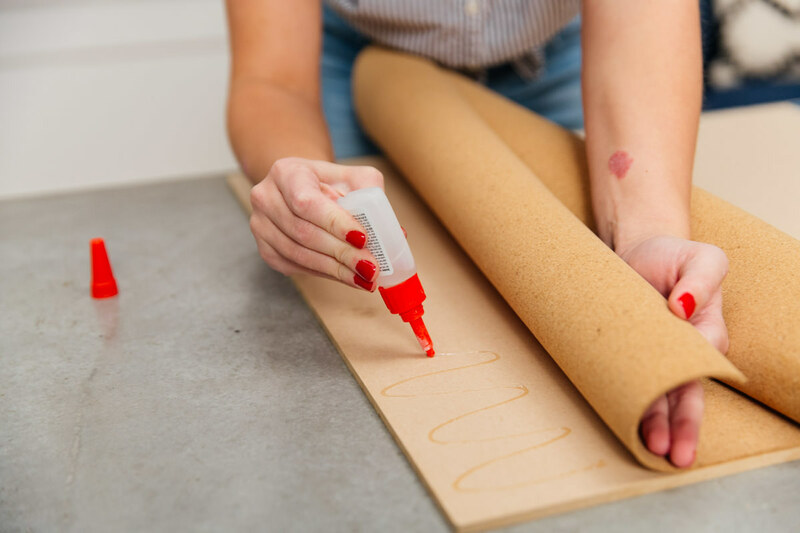 This will divide the chalkboard from the corkboard so that your bulletin board has both! 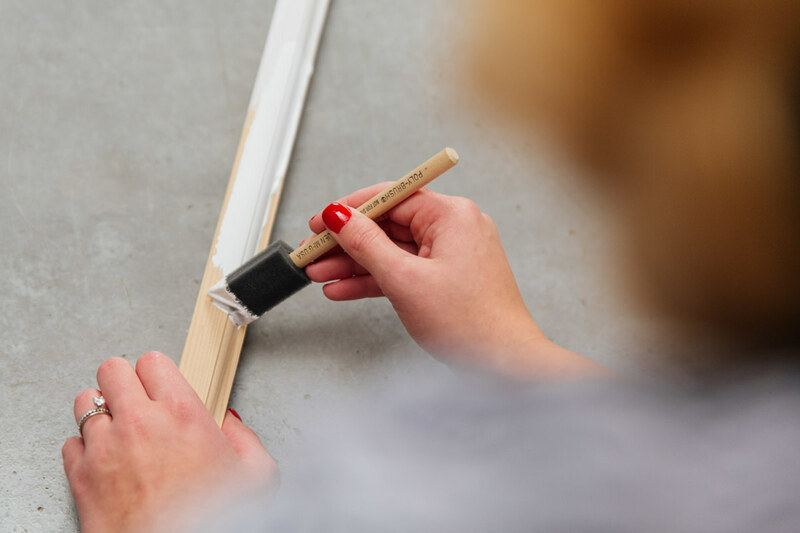 Before painting your moulding, grab a piece of sandpaper or a sanding sponge and take it to the frame pieces, the chalk holder, and the middle lattice piece. 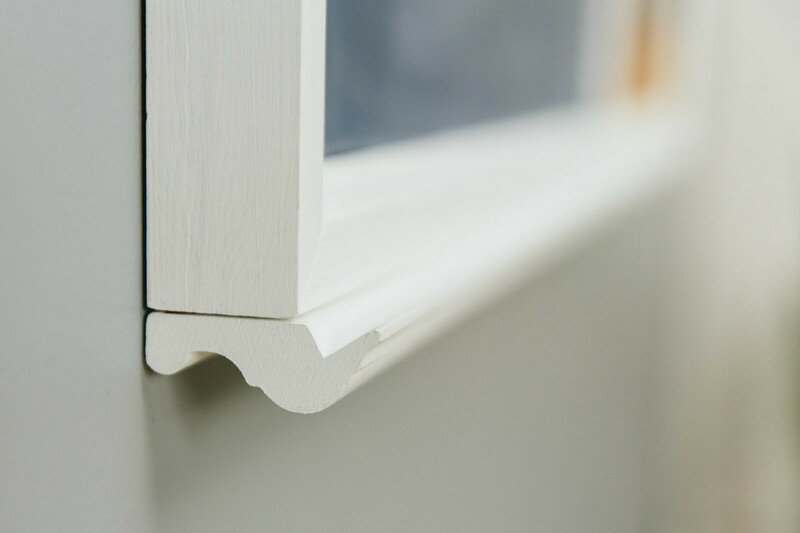 Pay special attention to the cut ends and corners of the moulding to prevent splintering. 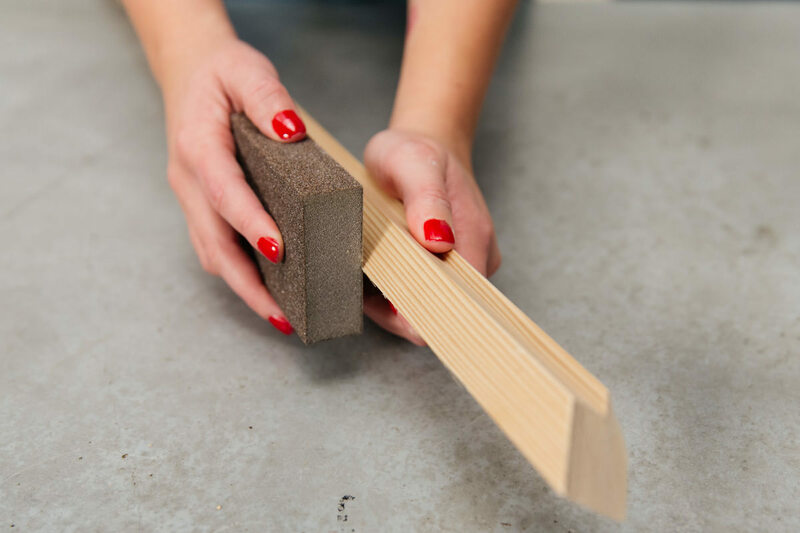 Use a tack cloth or a damp paper towel to remove sawdust before painting. Paint all of the moulding pieces white (or whichever color you like). I used a matte white paint, but I recommend a satin or semi-gloss finish because they don’t scuff or get dirty as easily. 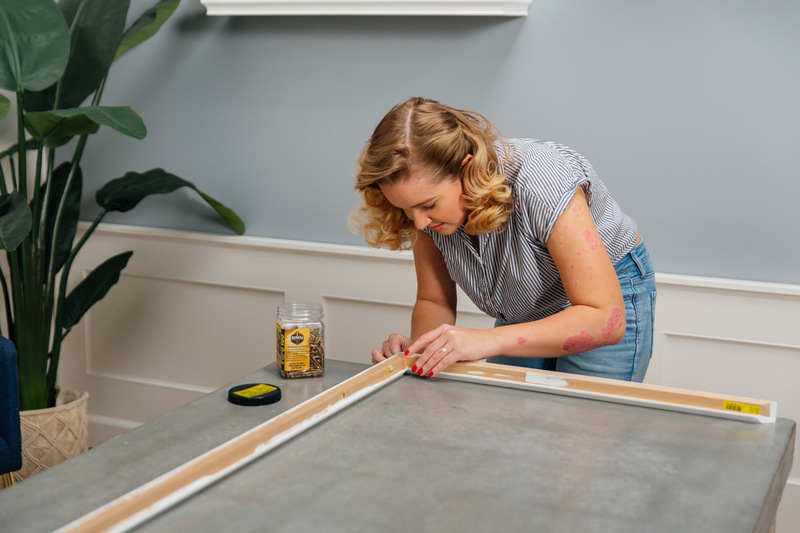 By using the same color for the frame as the trim in your home like I did, you can save some money using paint you already own and make this DIY project look like a perfect fit. Follow the directions on the side of the paint can for dry time and recoating until you have the desired look. Paint the left side of the MDF with chalkboard paint according to the directions on the can. I highly recommend using a quality synthetic paintbrush over a foam brush to get the smoothest finish on the chalkboard section of the bulletin board. Repeat this process until it’s evenly coated. To add some extra color to this project, I picked colored chalkboard paint from the Martha Stewart collection. I love the way the color turned out, and I found that the paint has good coverage and doesn’t leave a streaky chalkboard. But, fair warning: it is a very thick paint and the brush strokes never went away for me. I sanded between coats to try to counteract this effect, but it was still noticeable. 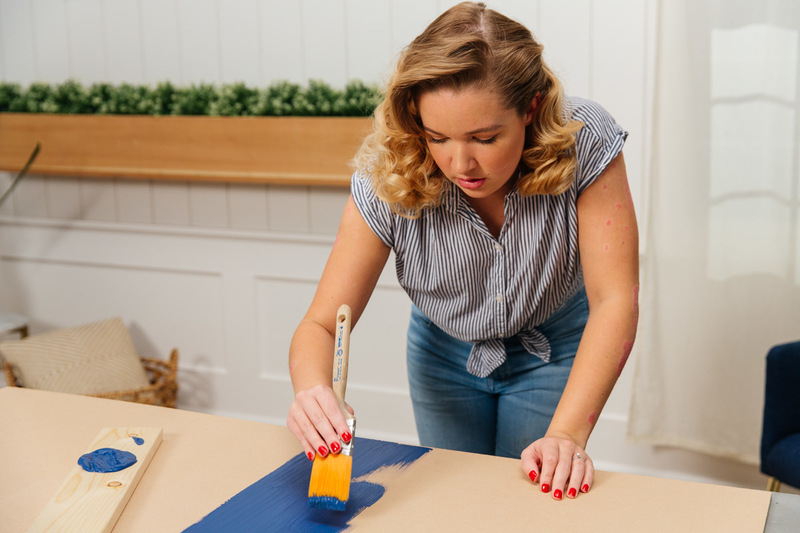 This doesn’t bother me personally and it doesn’t get in the way of writing, but if this is something that bothers you, I would opt for the Rustoleum Specialty Chalkboard paint we used for the original chalkboard calendar which results in a much smoother finish. The Martha Stewart chalkboard paint also doesn't give you any details about coverage or recoating times. I used two of the 2 ounce bottles to cover this 24" x 24" space with three coats of paint. The paint dried fairly quickly, and I waited about an hour in between coats. Next, cut your cork to fit the right side. 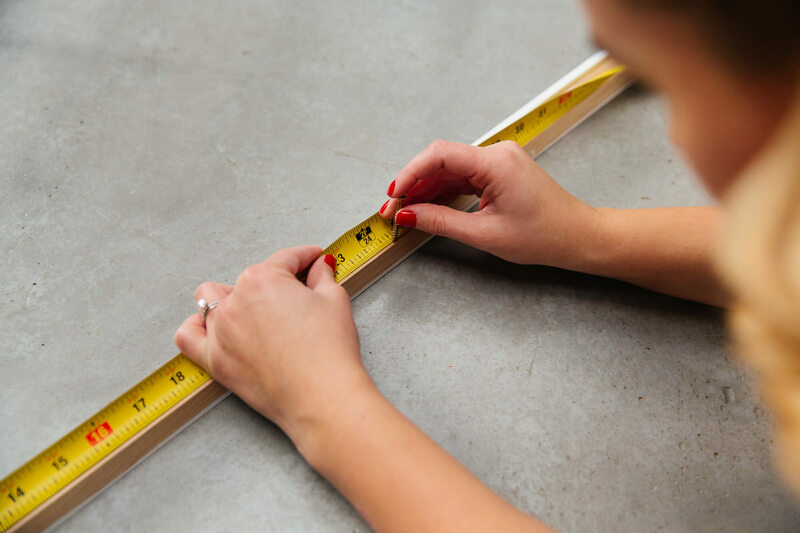 Measure for the height, then measure from the right side to the middle line. Subtract 9/16” to get your final measurements. Cut the cork with scissors, then glue in place with wood glue and weigh down the edges with books until it’s dried. Once it’s dry, trim any overhanging material. 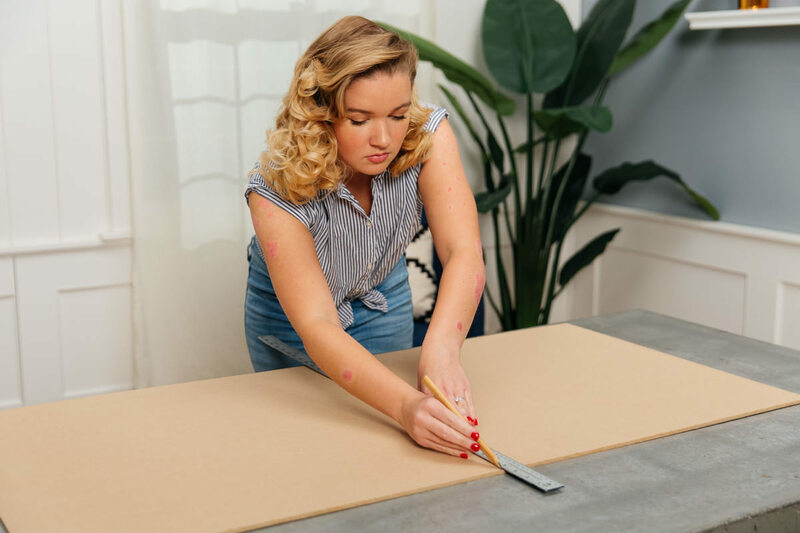 For added color and interest, you can paint your corkboard by covering the whole thing in color, paint stripes, or even a world map! We decided that simple was best for our particular space, so we left the cork as is, but the fact that you can customize this is one of my favorite things. 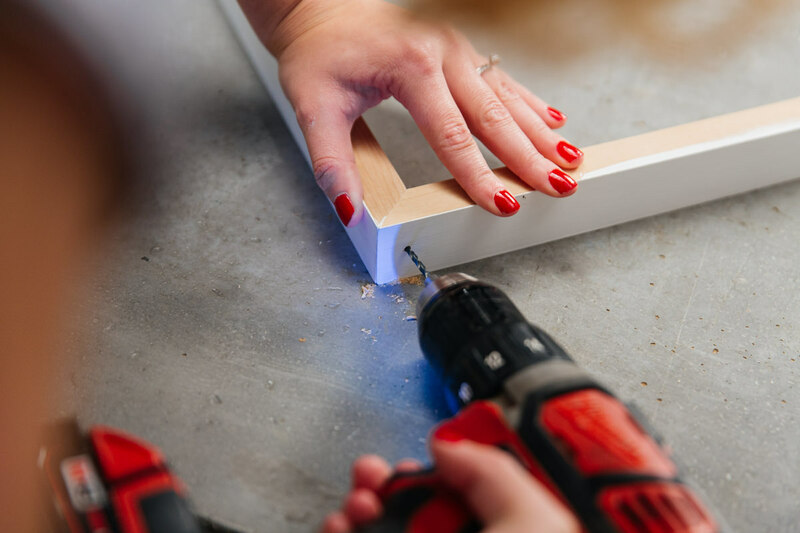 Before you put the frame together, grab the top piece and drill a couple large holes on the underside of the moulding. This will serve as a catch for screws when you hang your board up, so make sure the hole is big enough for the head of your screw. Then, fit the frame together and secure it with glue and 1 1/2” screws. When everything is fully dry, fit the backboard inside the moulding frame and glue it in place (we used a fast-drying wood glue). Use heavy books again to weigh down the corners until everything is dry. Make sure you don’t have any weight in the middle or you may end up with a bowed bulletin board. 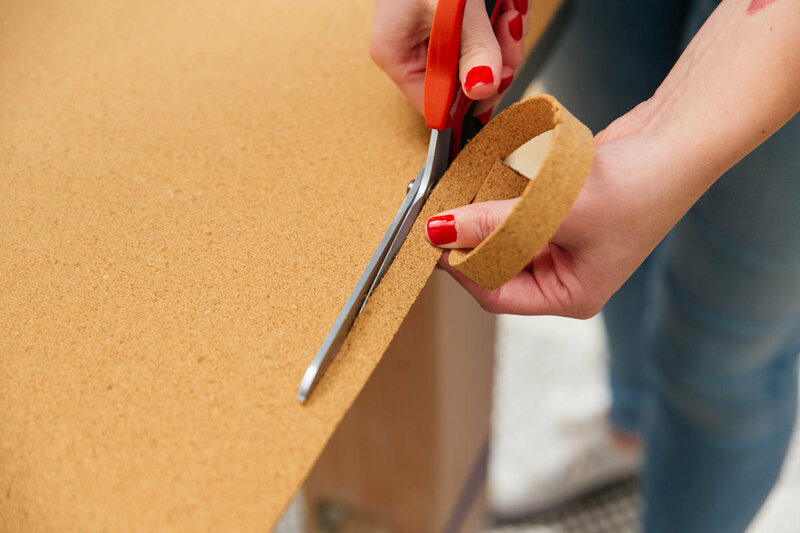 Use a utility knife between the MDF and the frame to trim any extra cork to size. When everything has dried, it’s time for the final touches. 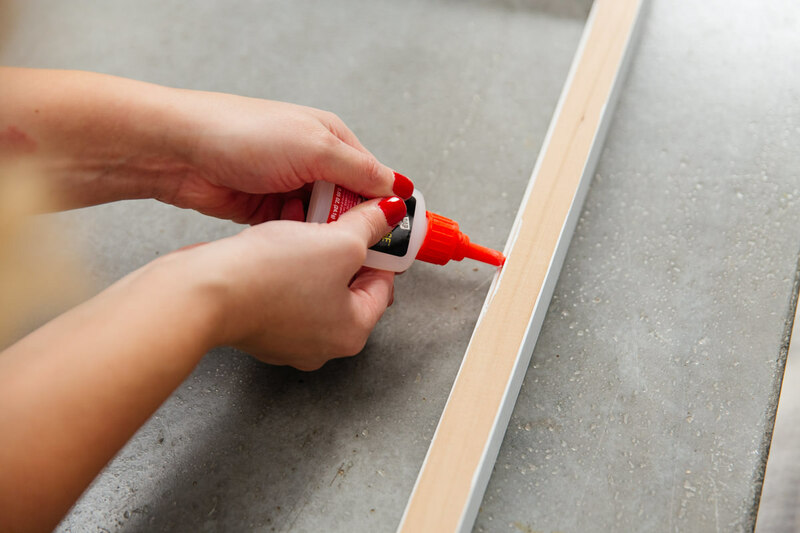 Flip the bulletin board onto its back and line up the chalk holder piece so the V-shaped groove sticks out in front of the moulding and acts as a chalk storage place. 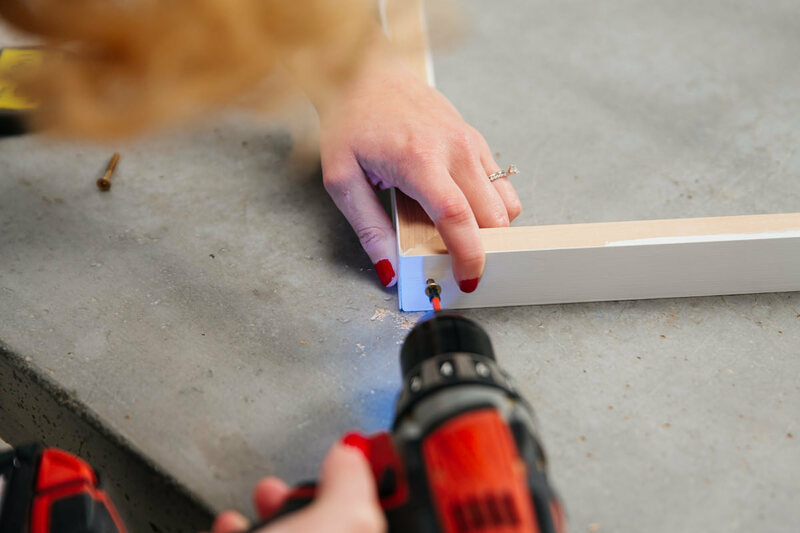 To secure the frame, apply glue and use some finish nails. To make hammering easier, pre-drill holes with a very thin 1/16” drill bit. Lastly, place the lattice piece in the middle, dividing the chalkboard from the corkboard. Glue it in place and let dry. The final step is to hang it! Put some screws in the wall at the same height and the same distance apart as the pre-drilled holes in the frame. I recommend adding sticky velcro strips to the bottom sides of the frame so it doesn’t shift when you’re writing on the chalkboard. As I mentioned above, this is great for keeping project inspiration in front of me when I’m in the studio, and for having a handy space to jot down notes. 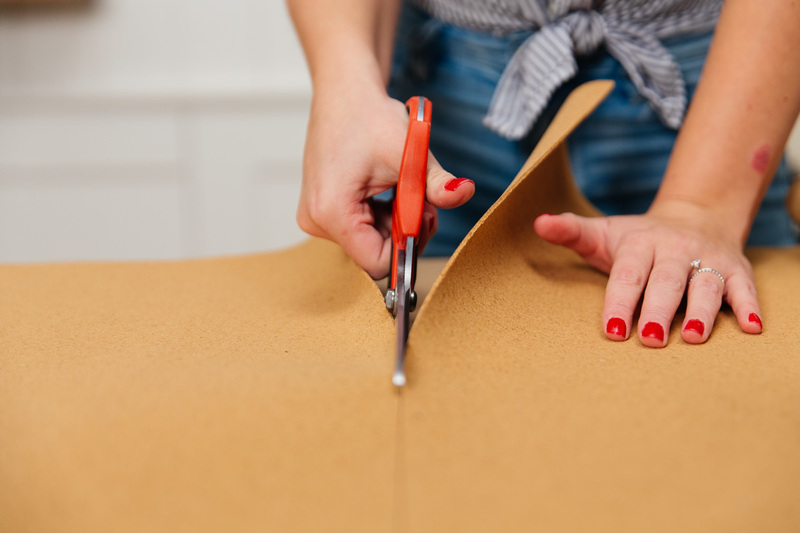 But it’s also great for getting organized and sprucing up the home during the spring cleaning season—especially if you have a small space you’re looking to maximize. Are you getting the spring cleaning bug? 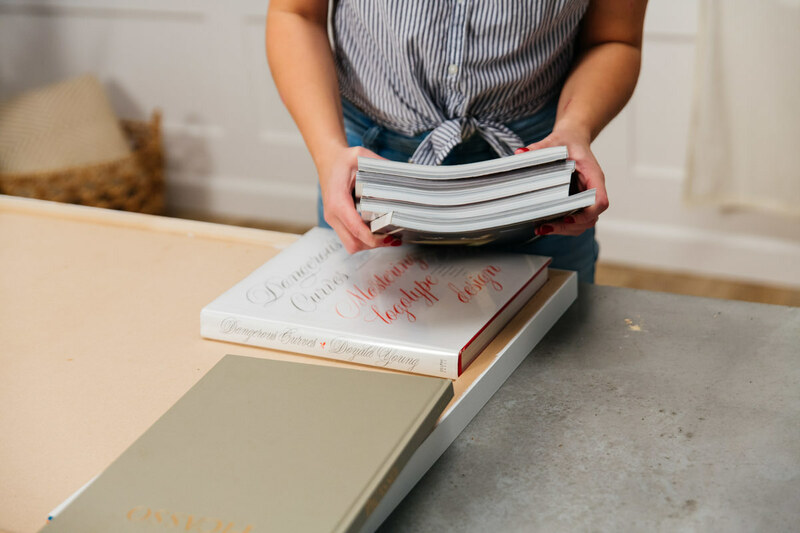 We've got tutorials to help you organize (or add small touches) and have fun doing it! Check out How to Maximize Your Living Space: Office and Bathroom and our DIY tutorials for a throw blanket and a shoe storage bench. Special thanks to Ellen Mauro of Inkwellington who did the inspired chalk lettering on this project! When embarking upon a project involving paint or primer, it’s important to find the right paintbrush. In fact, finding the right brush can make all the difference in your project. There are hundreds of paintbrushes on the market to choose from, so you might wonder: What paint brush should I use? 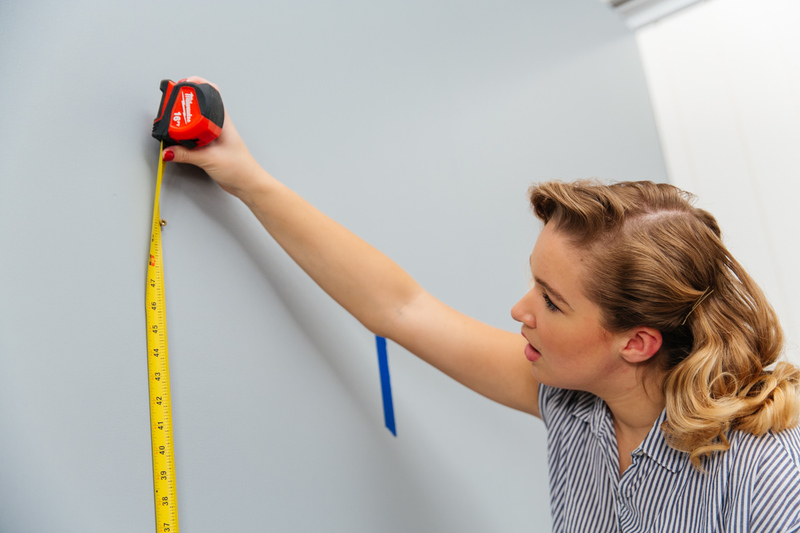 A pegboard is a naturally attractive and practical DIY storage solution for rooms with limited cabinet space.